Ice jams occur when warm temperatures and heavy rain cause snow to melt rapidly. Snow melt combined with heavy rains can cause frozen rivers to swell, which breaks the ice layer on top of the river. The ice layer often breaks into large chunks, which float downstream and often pile up near narrow passages other obstructions, such as bridges and dams. There have hundreds of ice jams throughout the history of New England. 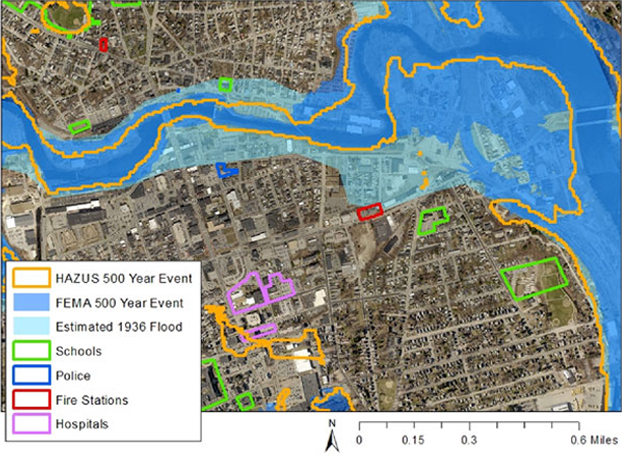 The most devastating winter floods have been associated with a combination of heavy rainfall, rapid snow melt, and ice jams. The Ice Jam Database maintained by the US Corps of Army Engineers, Cold Region Research and Engineering Lab, is a searchable database of historic ice jam events. What is the Risk of an Ice Jam in New England? Heavy snowfall and frigid temperatures, followed by a sudden warm spell can increase the risk of flooding from snow melt and ice jams. When river ice piles up at shallow areas, bends and islands it blocks the flow of water and may cause flooding of nearby homes and businesses. When Are Ice Jams Most Likely? Ice Jams are most likely to occur during the early spring months with the first winter thaws. Individuals and structures living close to rivers and streams are most at risk of flooding from ice jams. What Causes an Ice Jam? During thaws, runoff from snow melt increases the flow of water in rivers. This increased flow raises the water level, which pushes up on ice sheets covering the top of the river. If the ice sheets break apart, it moves downstream in a surge large ice chunks. In places of restricted water flow (such as shallow bends in a river, an intact ice sheet, or around bridges), the ice can pile up and an ice jam will form. The jam may then buildup great great enough to dam the river and cause flooding. Mitigation is the cornerstone of emergency management. It is the ongoing efforts to lessen the impact disasters have on people and property. Mitigation involves keeping homes away from floodplains, engineering bridges to withstand earthquakes, creating and enforcing effective building codes to protect property from hurricanes — and more. Developing and enforcing all-hazards building codes. Adopting incentives to encourage mitigation. Developing administrative structures to support the implementation of mitigation programs. Mitigation should be incorporated into land use management plans. Developing and conducting public information campaigns on hazard mitigation should be a priority. Ice jams on small rivers can cause serious flooding in a community, but damages are often too small to justify conventional flood-control measures such as dams and levees. Environmental concerns can also make these options unattractive. The US Corps of Army Engineers Cold Regions Research and Engineering Lab (CRREL) has developed two low-cost structures to control ice jams on small rivers. These structures are also designed to minimize environmental impact. A Tension Weir is a seasonally-installed rubber weir supported by meshes and wire ropes. It forms a pool to capture “frazil ice” that would normally collect downstream and pose a danger of freezing up and causing an ice jam. Tension Weirs up to 4ft deep and 100ft wide are feasible. The Sloped-Block Ice Control Structure is a series of massive, sloped blocks placed across a river adjacent to a natural floodplain away from developed land. Large gaps between the blocks (10-15 ft) allow easy fish and canoe passage. But ice pieces moving downstream during spring breakup plug the gaps, forming an ice jam at a safe location and reducing the threat of flooding downstream. This technology can be used on most rivers that do not support commercial navigation. The most common hazard is flooding upstream of the ice jam. Ice Jam mitigation is the same as that for flooding.